If you ever want to see how the greats wrote letters, Google the writings of Thomas Jefferson, Emily Dickinson or Edgar Allan Poe, to name a few. Of course, they were forced to write in the absence of other means. But could they build a phrase. Many of their missives were to business associates and other influencers (oops, bank terminology. Slap my hands.). But they wrote page after page to friends, too. On the plane ride home from Coeur d’Alene, I wondered what could possibly be said to Jane and Dave to even remotely begin to thank them for their generosity. Now and again it’s good to regain perspective on the meaning of good friends in our lives. So it was with Jane and Dave. Even so, whatever I managed to scrape together would be relatively paltry. In particular, Jane needed to know the lay of the land. Here’s what she got from me sometime late last week. Far from what Jefferson, Dickinson or Poe might have penned, but even us lesser-lights have our moments. Jane: By the time you get this we will be more than a week removed from what was an unbelievable trip. Dave sent a post-trip e-mail that tended to put things in the proper perspective in terms of friends mattering most. There was an article in this morning’s Observer to the effect that the older we get, the more worldly perspective we seem to gain. There is no way I can properly thank you for including me and for your overwhelming generosity. Before the trip it was hard for me to set aside, let alone contemplate stepping away from, all the things going on here in Charlotte. That is, until we hit the ground. All that melted away, and that’s a credit to the other three for bearing with me. They’ve all been very successful in their own rights, and that was very heartening. Dave seemed very relaxed to me, which was entirely the point, I suppose. Hell, we were all relaxed. Your hubbie’s mild snoring aside, he was a good roommate. Literally, you left no stone unturned on this little adventure. The travel arrangements, the food, the lodging, the golf, the spa treatment, the timetable. By the time we got to whatever the next installment of our journey was, you’d already talked to the staff. The skids were literally greased wherever we showed up. In your next life you will come back as some high-ranking travel advisor to presidents and kings. Even Furstenau, who is used to this sort of thing, was effusive. In a couple of weeks time I’ll blow through Des Moines (arrive Oct. 11, I think) and hope to at least see you guys for a few moments as I continue east and south. I’ve got a book project in mind that I’d like to run by you (since you are already a published author and I’m still a wannabe.) I’ve got both of your phones plugged away in my phone, so watch for a call. Apologies for the blurred image. 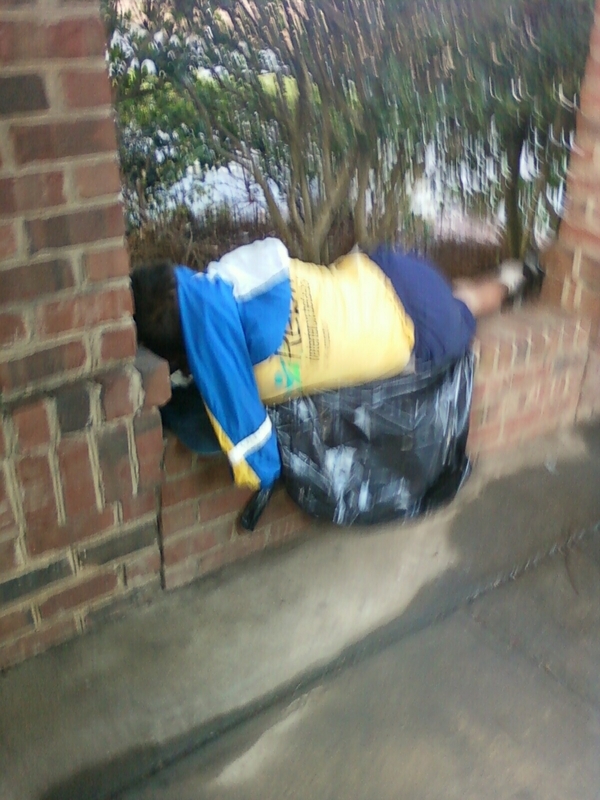 I took this cell phone image while on the move after my footsteps woke this homeless man. Sunday morning about 7:15 , a little later than usual, I hit the streets for a walk at leisure-speed, armed and emboldened by a strong – brutally strong – cup of coffee. The path is a typical route of about 4.5 miles (Sharon View to Colony, on to Sharon, a right on Morrison, left on Delaney, another left on Fairview, right on Sharon again, then a left on Sharon View and on to home). The goal is to get the motor running, think about the day and week, and just get outside. I had some outside company as my walk neared it’s end. Directly alongside my path and not 10 yards away from four-lane Sharon Road, was a homeless man, asleep. Or at least asleep until I noisily went by. Charlotte has a lot of such tired men. His interrupted slumber was a metaphor. There is always someone worse off than you. That’s a point my letter made to Ellen and Reid this week – which is my last at the bank. There is always someone worse off than you. Here is last week’s letter to the kids. Ellen/Reid: My plane hit the ground last night about 11:45 and that ended what was really an incredible trip. It was pretty much the great escape and it was great to see Dave H__________, Bob F___________ and Dave D___________ in Coeur d’Alene. It’s quite the spot. Not real high (alt. 2,200 ft.) but still mountainous and the lake is incredibly clear. The town of Coeur d’Alene is nice although none of us could see ourselves living there. We boated on the lake, drank wine, played golf, drank more wine, golfed again and ate like nobody’s business, followed by still more wine. The town was as you might expect, filled with tourists and mountain people. The golf course was lush and manicured. We had a young guy caddy for us although we were on golf carts. Our group really didn’t spray shots all over the place so that left him to clean clubs, fix ball marks and read putts. 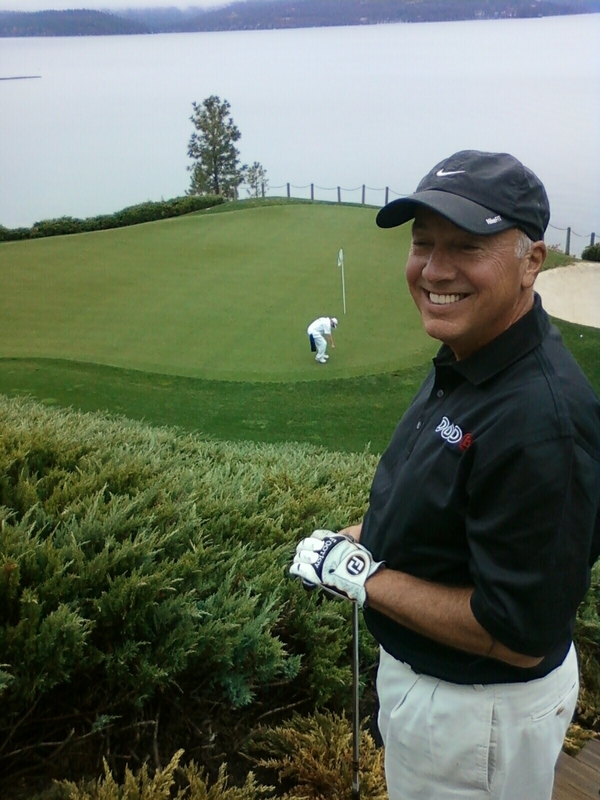 Dave H. made a mile of putts on the final day to take the steam out of the rest of us although bob claimed the big bucks. On a side note, the pro shop did a nice job of displaying Pat’s Stonehouse golf prints and they said the prints really sell well. Somehow, I need to think of an appropriate way to thank Jane for her planning and enthusiasm. If you have any ideas, send them my way. 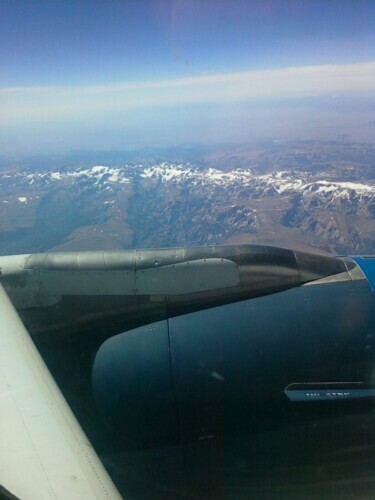 On the way out we flew directly alongside the Bridger Wilderness in Wyoming. From my window seat on the port side of the aircraft I could see the lakes and stream beds where we fished and camped, and other peaks that we traversed or climbed. It’s just an incredible place. I will do everything in my power to swing a trip out there next year and of course you all are invited. As we cruised at 31,000 ft. and the range crept slowly by it seemed to me that of all the places I’ve been to, this is without doubt my favorite spot in all the world. Not entirely sure why that is since there are higher, craggier mountains. But nothing on the scope and sheer vastness of this place. But now it’s back to the real world. Have an interview later this morning with a local firm and we’ll see how hard they want to kick the tires. I hope quite hard. It’s a media relations job. The firm does environmentally related work and that has some appeal to me. I am ready to work and am anxious for something to pop. It’s all about throwing mud at the wall. There are enough irons in the fire that hopefully something will spring free. All it takes is one. In the afterglow of the trip I was moping on the drive down to the office (I have 10 more days here) until I saw a homeless guy sleeping with his face impressed directly on the brick walkway just down the block from my office. That’s when it occurred to me that there is always someone worse off than you are. That was a pretty indelible image. There’s always someone else worse off than you are. On the plane I continued to draft what is a business plan and content for what could be my business web site for PR/media relations/content. Reid, I should have that to you in short order after some additional massaging. I’m trying to position myself as something of a hybrid communicator; someone who’s been a writer on the national stage as well as someone who’s been on the PR side of the ledger, too. Hopefully someone will warm to that pitch. That’s my niche. My first client in California likes what I’ve produced so far. They put it to use instantly. I met with a woman last week who’s a few years my senior but has had her own little consulting/process change business the past 15 years and she thinks there are good possibilities. But I have to make hay right now. Well, that’s about it from Charlotte. Let me know how your holiday plans are progressing and where you will be in November and December. Not sure how I can dovetail with either of you but will make it happen if I can. Hopefully we’ll have other things to celebrate by then. 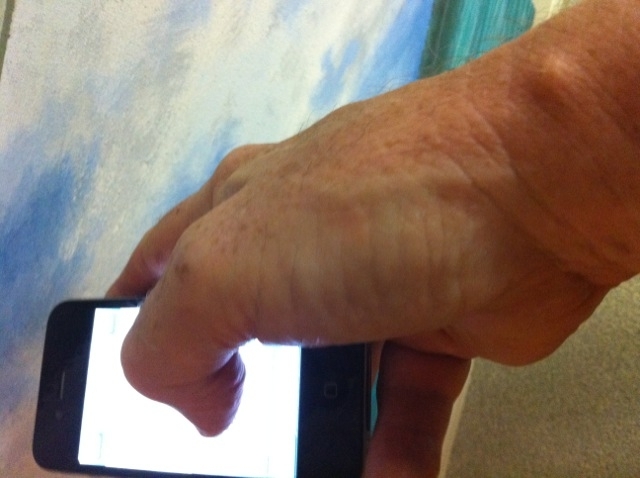 The little nodule on Bob's wrist is a sign his knotted-up tendons have rebelled against his rampant use of phone technology. My friend Bob in Des Moines goes under the knife soon for an entirely self-inflicted, and typically painful, ailment known as de Quervain’s Syndrome (aka washerwoman’s syndrome or mother’s wrist). Basically, it’s a repetitive motion injury. It was first identified in 1895 by a guy named Fritz, and Mr. de Quervain had no idea his observations would apply to more than scrubbing floors and lifting babies. Seems Bob has texted way, way, way more than a wrist can handle. Look up the textbook definition of repetitive motion injury and you’ll see Bob’s name. Bob is a tech guy’s techie. He knows his way around an iPhone better than anyone alive. That includes the developers. Just as the rest of us are trying to figure out how to direct dial, Bob pushes the boundaries of tech-knowledge. In Coeur d’Alene he drove us nuts with continual and usually unsolicited demonstrations of “apps” that ranged from a circular rotating compass to guide our way if we got lost to a hand-held seismograph that recorded his heart beat or jolts when the SUV hit bumps in the road. We rode Bob hard (the derision was good natured) about his addiction to technology. Bob’s loss is the hand surgeon’s gain. Let it be said that unless I begin to sit awkwardly at my laptop keyboard, I should manage to avoid de Quervain’s Syndrome or a similar overuse ailment. I suppose correct posture and proper ergonomic design of a keyboard are a saving graces to letters. Bob will recover soon enough to rejoin the ranks of texters, although I hope he’ll subscribe to whatever “app” will make it easier on his thumbs. Here’s today’s letter to my mother. A seven minute exercise from start to finish. Things are improving for her medication-wise. I hope this letter adds a minute or two of brightness to her day. Mom: Officially it’s supposed to be fall right now but the weather guy says today will be another day in the 90s. Your first frost can’t be far behind and we still worry about sun screen and tee shirts. There are now drought conditions in some parts of the Carolinas. I have a little drought situation in my own neck of the woods; the plants in my window boxes are goners since they had stopped flowering and I stopped watering them. I’ll replant something in their place. Was on the porch the other day when I noticed that my parsley plant was awfully scrawny and didn’t have many leaves. On closer inspection, it was filled with a yellow and black banded caterpillar of some sort. They had munched the plant to nearly nothing. So I picked them off and squished them. But in an idle moment I wondered what they were so I looked up North Carolina caterpillars on the Internet. It seems these were destined to turn into Swallowtail butterflies, and here I’d just assassinated about 20 of them. If I’d known that I would’ve let them live. Incredibly, the background on the worms said they preferred plants in the parsley family. Well, they found mine to their liking. Was in Coeur d’Alene, Idaho last weekend with some friends from Des Moines. These were guys I’ve known a long time, and it reminded me how I’ve not been able to see old friends for quite some time. So it was good in that regard. We played golf and had a great time eating and laughing (drinking wine a little bit, too). We played a course where they had an island green you had to take a boat to reach. The kicker was if you hit the green on your first shot you got a certificate. I plunked my ball in the water the first day but got a certificate on the second day. It wasn’t a gimmee in that it played about 165 yards both days. Nice course, and it was in the mountains which I have missed. Flew over some familiar mountains in Wyoming. That was fun to see. Ellen goes to Des Moines this weekend for some event. Reid told me last night he wants a new computer but this time he’s going to build one. How the heck do you build a computer? He’s already got a jazzy laptop but he says that’s not powerful enough for all the stuff he wants to do. Don’t ask me what he wants to do but he needs a mega-computer to do it. Good for him. He had a good review at his ad agency job this week. That made his week. Not much going on in these parts. Probably take the bike out for a spin this weekend. Likely will head to South Carolina for the day Saturday. The forecast is for rain on Sunday which is sorely needed around here. Of course, the big news is I leave for Grand Island in a couple of weeks and will see you very soon. Just make sure the ice cream shops are still open, and I’m sure we’ll find a good joint for a burger and a beer. 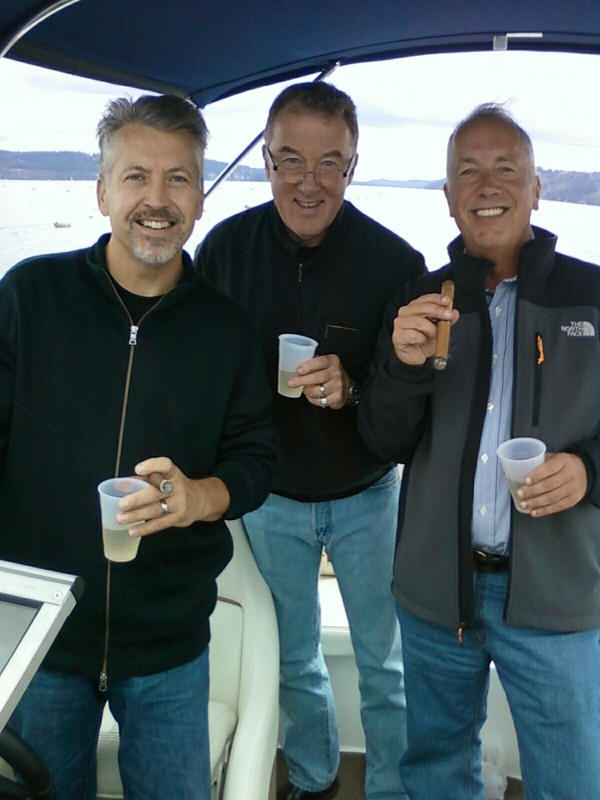 Dave, Bob and Dave afloat on Lake Coeur d'Alene. The tourist season had come and gone so it was the perfect time to visit. Next time: Pinehurst. The real world took a breather last weekend. Along came Coeur d’Alene. Pure and simple, it was a junket. A guy’s weekend. Golf, food and wine. You could reverse the order and still get the same results. It was the better part of four days with the impact of seven. It was my first time around old (figuratively, not literally) friends in quite some time. Ellen and Reid knew of my misgivings about taking time away from my current predicament, but any apprehension dissolved quickly amid the camaraderie. It was good to be there and to be with my boys. The chief culprit/chief planner was Jane, Dave’s bride. In her next life she will be an event planner to royalty and/or presidents. A few weeks ago I posted the letter sent to her and Dave where I caved to her persistent invitation (effectively abetted by Bob’s equally persistent battering). I don’t know where the renewed contacts with these guys will lead, but they will lead somewhere. Housekeeping: this is the final week of three-day-a-week posts. I’ll scale back to Tuesday-Friday postings. I reserve the right down the road to return to the thrice weekly regiment as time allows. As they say when interminable corporate conference calls end mercifully early, I’ll give you some time back. But it is Wednesday, as it always is at midweek. Here’s a prior message to my two young adults. Whew, feels good to be back home again. That’s enough driving and sitting around hotels for a little while. Grandma and Grandpa were so glad to see you guys, although they were a little disappointed in your appetites. I built you guys up as having bottomless pits when it came to food, but the best you could do was appetizers. They enjoyed seeing you. The house painters are here this week, both inside and out. We’re debating colors right now and already it’s clear that my choices will lose. Your mom was talking to Amy F______ last night as I got home from my walk, and they were conspiring with other paint selections. Heck, it doesn’t matter all that much. Just get the damn thing done. Alas, the raspberries have come to an end. We had raspberries every morning for weeks, not many, but enough for cereal. But we still have plenty of tomatoes for BLTs. Now that’s eatin’. Too bad Iowa State got worked by Nebraska. The papers here were all over the overtime loss. It just goes to show that the Big Red is back, sort of. Reid, have a good time in Lincoln. Just don’t let us see your name on the police blotters. It’s too bad that Afton is packing up for Grand Rapids. Tough deal losing your job that way, but the Internet is a touchy thing with a lot of employers, especially on their time and on their PCs. I hope you come out of this with another good roommate. You guys have learned more out of college than you learned in it. Very hot yesterday and today. 90+. But it will be down in the 30’s by Thursday and Friday so it seems fall is about to come and go very quickly. Pittsburgh sure was pretty but the downtown is on the dead side. It was a steel town for a long time, but all those mills are long gone. The one guarantee I can make this weekend is that I will be out of here on Sunday. Your mom and Molly H______ are hosting a wedding shower here for Lynn G________’s son Aaron, and thankfully my services won’t be needed. However, it’s been made abundantly clear that the lawn will be mowed, the weeds killed, and sidewalk edges trimmed and the mulch renewed at the front door. Other than that, there’s not much to do. I think I’ll ride down to Missouri since I’ve never ridden in that state. That will lift my state count to 12. Got a fair amount of work to do this week for ___________, ___________, ______________. Mostly writing stuff. Did you see the article in the Pittsburgh paper about your Grandpa’s reunion? I can’t believe the editor’s there took a flyer on me and allowed me to write it. Well, I’m off to the salt mines right now. Give us a call if you need anything. Except money. I know the paths very well on these mountains. It's the Bridger Wilderness in Wyoming: my favorite place in the whole world. I'm going back there in 2011 come hell or high water. These wonderful peaks are a big part of what you'll read about next Tuesday. Writing is, I think, a three part endeavor. A huge chunk is inspiration. Researchers know that writers write best when they have an emotional connection to their subject. Then there is affinity. If you identify with the written word, you’re money ahead. The final leg on the tripod is the diligence to refine your skills. Like anything else, the more you work at it, the better you become. Practice, practice, practice. So it was that as I idled in the coffee shop at the Charlotte airport the other day, a young woman seated next to me was pecking away at her hand-held. Her thumbs would punch a few keys. Moments later an apparent response came in, and she’d then hit a few more keys. The process repeated itself for a few minutes. My eyesight is such that I couldn’t (and didn’t want to) make out her keystrokes. What was she learning? Certainly she wasn’t crafting full sentences or punctuation. Even so, she forced herself to form ideas and thoughts, however cryptic. I wondered, too, how or if she might make the transition to the sort of writing I prescribe because you can’t live by acronyms and partial sentences alone. She got up and left soon enough, still pecking away as she walked. Her approach was better than nothing, although her ingrained habit may not allow her to stretch her writing wings far enough to move beyond the small screen of her phone. 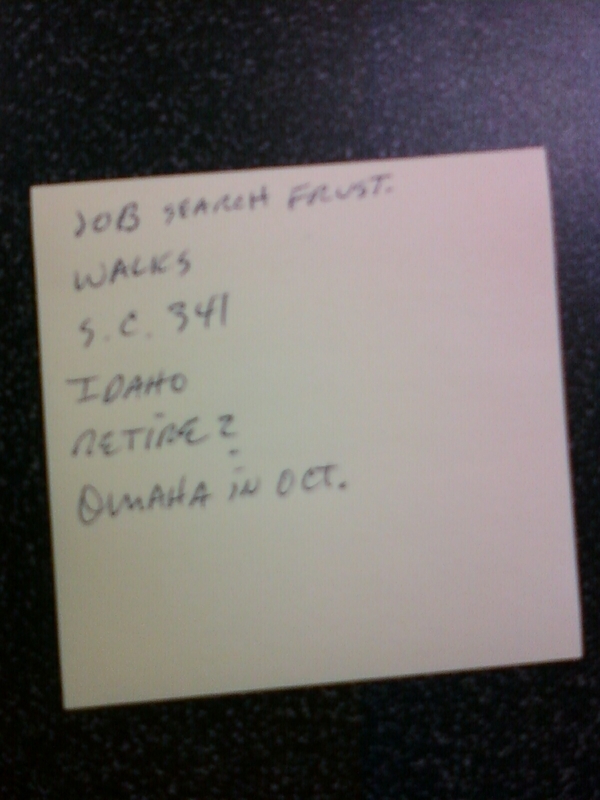 Ellen/Reid: You cannot believe the itinerary Jane H____________ sent me for this week’s trip to Idaho. It’s almost a work of art. I forgot to bring it to the office but I will photocopy it so you can see the attention to detail. Every bone in that woman’s body is creative. I’ve had to force myself to not look forward to the trip but now am getting somewhat jizzed over it. It will be good to see the guys. I talked to Dave last week and he’s easing back into things. My assumption – and wrong at that – was they pulled up roots and moved to Naples, FL. But they are back in Des Moines. I’ll call you two from the road this week. Your uncle is dead-set that I will be in Nebraska the week of October 4. Sounds like an Odyssey to me. I’ll make a bee line straight to Grand Island to see your grandmother for a couple of days and then we’ll work around your grandparent’s home in Omaha. Ellen, your idea to stash the fine china at Jane’s place is a good one. Consider it done although I wouldn’t mind the further Odyssey to St. Paul to see you and Mr. T. Reid, if I head up to MN then I would likely stop in Chicago to see you. Most of the tools will be given away to Goodwill although I’ll keep some aside for you and will bring those to Charlotte. I suspect my car will be filled to the gills once I get back home. Nothing happening on the job front. No interviews. That’s mildly discouraging although from what can be gleaned from the business pages of the newspaper it’s not entirely uncommon. I’m far from giving up, however. Ellen, your comment about the ‘R’ word isn’t too far off. It has some credence to it. In some ways it might be okay to scale back the totality of the work effort, particularly if something hourly could be found. So I may well go down that path although, Reid, I still want to build out the web site for a side – and perhaps full time – PR and media relations business. I still have something to contribute in terms of skills and experience. It’s just hard getting people to take notice. If I did find something hourly, say, at Williams-Sonoma or some place like that, then I could write in the morning and work in the afternoon and early evening. I would be down with that. To compensate for things I’ve been taking more walks. Therapeutic in every sense. I can blow the steam off, think about things to come, blow off a little more steam and just get in a pretty good workout. Usually its 45 minutes to an hour or a bit more (minimum 2.5 miles and usually 4.25) although last weekend I got carried away on a six miler on a hot day and was really dogging it the last half hour or thereabouts. I’ve learned my lesson. We have established that there is literally no traffic on South Carolina highway 341 out of Florence toward Charlotte. It cuts straight through backwater portions of South Carolina and in all honesty, in 50+ miles of table-flat road there was only one or two cars seen in either direction the entire way. It connects nothing to even more nothingness. Backwater South Carolina is interesting for no other reason than the housing. Much of it is manufactured. The Harley is the best way to see the countryside especially at 50 miles per hour. If I had hair, the wind would blow through it. Lots of riders in those parts don’t wear helmets but I keep mine on. Haven’t played golf with my singles group in going on two months now. Every time someone asks me when I’ll come back my response is ‘when I get a job.’ No other way to approach it right now. As much as I miss golf and the group it will just have to be this way for the foreseeable future. My hopes are still high, so I don’t want you two fretting too much about your old man. Things happen for a reason, and when the right thing does happen, you’ll hear me yelling from here. 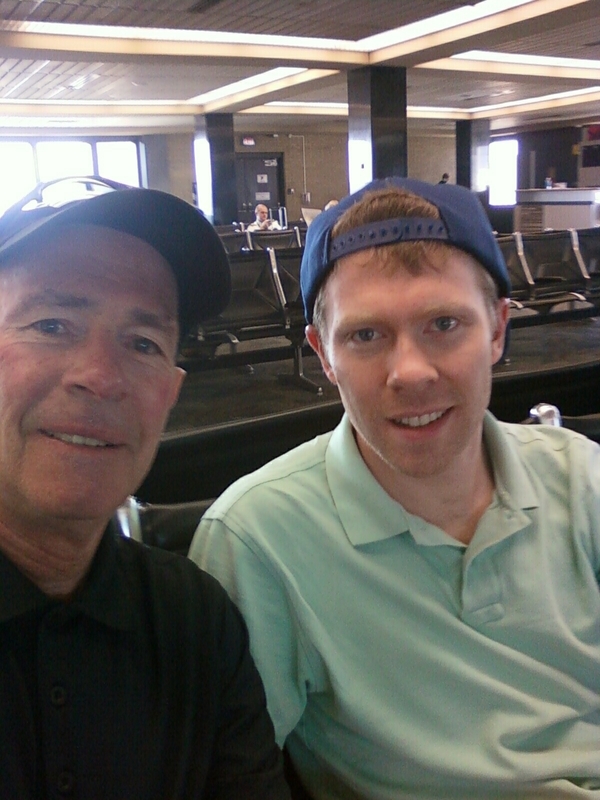 You don't get to see Reid often...but here's the lad with his old man as we wait for a flight out of Omaha in mid-June. He's a good kid and is the king of digital advertising. It would be easy to see why most folks perceive I’m overly reliant on weekly letters to Ellen and Reid with a few texts tossed in for good measure (we rarely e-mail each other). True, letters do a lot of the heavy lifting. But not all. One cannot hide behind letters alone. In a way, the letters are a seat at the conversational table. Each page gives us an opening on the phone; i.e. ‘I saw this in your letter’ or ‘tell me more about that’ or ‘what’s up with this?…’ The letters give us something to talk about once we get past the obligatory ‘what are you up to?’ ‘Oh, not much’ banter. At the least they have some advance warning about what’s happening on my end of the spectrum. Perhaps subconsciously they gain time to process information before their custom ring tones alert them that dad’s on the line. Better pick up the phone, guys. Since I’ll be on the road this weekend, I sent my mother her typical letter a few days early. Nothing earthshaking to share this week. Mom: Now it’s clear to me why skin doctors make the big bucks. There are lots of people in their waiting rooms and the waits are long. This morning I lounged for about half an hour before they called my name – and my appointment was at 8:15. He gave me a good going over followed by a stern lecture about the sun. He snipped off a little thing on my nose and sent it in for a test and the results should be back in a few days. We’ll see how it goes. He underlined the urgency by wanting to see me again in two months. I’ve become an annuity program for him. I’ve been trying to wear sunscreen and hats as much as I can. I think this is residue from my lifeguard/pool manager days back in the swimming pool business all those years ago. If only we’d known then what we know now. I’m trying to gear up for a car trip out your way in the next month or so if I can swing it. I can’t wait to stop by your place and check out your new room – and also check out the food. If it passes my inspection then it’s good. No doubt we’ll make a break and head out to some restaurant or ice cream joint that I know you’ve been to. I’ll stay with Ralph and Gayle, and probably make a side trip to Des Moines to see my friend Steve. I’ll bring my woolies with me since the temperatures out there will probably be far cooler than the heat we’ve been having here. Yuck. But it’s good for my tomato plant. Nebraska seems to be cruising in football. Their schedule isn’t the toughest and that may hurt them in the rankings. Of course, none of the Husker games are broadcast down here and we’re stuck watching Southern teams play Southern teams. It gets a little old. I’d rather watch the “name” teams play. The local pro NFL team, the Panthers, got waxed last week by the New York Giants and already people are saying the entire season will stink. Probably so. They’re just not very good. Hey, they could pay me a million and I’d make a few tackles. Rode by some cotton fields in South Carolina last weekend while out on a cruise on the Harley. The locals say they don’t’ see as much cotton grown around here because all the cotton business has moved to China and other factories overseas. This used to be a big area for cotton mills and cloth and clothing but all you see nowadays are plants that are shut down and shuttered. I’m telling you when you ride the back roads in the Carolinas you wonder what people do for a living. It’s depressing. Hey, Ralph says your new medications are nothing short of wonderful. That is wonderful. Glad they finally found a combination that works. No news from either Ellen or Reid. But I take that as a good sign that they’re not in trouble (that I know of) and they’re keeping their noses clean and going about their business. Like Andy and Joe, they are living their own lives. Can’t wait to see you! The usual sticky pad with cryptic notes for last Monday's letter to the kids. It will be posted on Sept. 20. There are times from the past couple of months when its been a real struggle to decompress. A hundred or so posts ago, I went off on a tangent on how extraordinarily relaxing Monday letters (any letter for that matter) were for me. It’s even more so now. You grab moments of relaxation when you can. I’m no shrink, but you don’t need to lay prone on an office couch at $125/hour to know internalization is not a good thing. Get it out, and get it out often. Ellen and Reid have felt the brunt of the getting out. None of it has been down-for-the-count stuff. Rather, its more here’s-where-I-am-at-the-moment, plus the oft-mentioned assurance that things ultimately will be okay and whatever course I’m now on is just another detour toward whatever is at the end of the (job) road. I dawdled on the Monday letter and took my own sweet time. Whereas it was formerly a six to 10 minute sprint, now I’m trying to figure out how to stretch the pleasurable part to 15 minutes. From there, I’ll aim for 20. You know what Wednesday means. Another blast from the past. Reid, honestly, we were glad you used the fire pit when your friends were over here. Really, it was all good fun and food (usually paid for by us) and everyone seemed to have a good time telling stories and swapping lies. We didn’t ask a lot in return (other than everyone’s car keys.) Still, imagine our dismay when, after months of sitting underneath the green plastic cover, what to our wondering eyes should appear but a mold encrusted, stinky, half-charred and decaying pizza box PLUS several shrapnel-ized cans of Guiness that look as if they were exploded by cherry bombs. Next time, just make sure you empty the fire pit of illicit or funky contents. Oh yeah, and make sure you tell us when the BBQ tank is empty. Finally, the Harley has passenger pegs. What an ordeal. Part of my own making, part of the dealership’s fault. Without exaggeration, I made 6 or 7 separate trips to get parts, only to learn that there was still one more minor piece (such as a chrome washer) that was needed. Geez, now it’s all together. We were watching TV last night – I was watching, your mom was only partly watching – when a show came on about Kyle Petty’s bike ride across the U.S. to raise funds for children’s hospitals. ‘Wow’, I thought, ‘that’s neat. I could be part of a good cause and ride across the country.’ So, this morning I go to his web site. The cost of a solo rider to take part: $10,000. I guess I’ll be riding alone. We ventured on the wild side this weekend by borrowing Holly and Dana’s two person kayak. We wanted to float the river but decided our maiden voyage would be on the lake in West Des Moines. It was quite a bit of fun, but the water was super yucky. We did see lots of birds and stuff. All the fish had 3 eyes, that’s how bad the water was. People were fishing but who would want to eat anything out of gunk you can’t see two inches down? We’ll do more wild stuff next weekend when we go camping with the __________ and everyone else at Lake Keohma. Spur of the moment events are few and far between but we went over to the ______’s on Friday night to celebrate Stacy’s 46th. It was a lot of fun. When you get older, you tend to celebrate more because you know you’re on the downward slide. I’ve tried to call the “Your 2¢ Worth” column repeatedly, but the mailbox says it’s full. I was going to leave the message that ‘Hey, I know what the “W” stands for on all those car stickers: Wrong.” Get it? If the paper ever runs it, you’ll be the first to get autographed copies.